Newport Beach, CA & Stamford, CT – November 1, 2017 — Each year, Mischler Financial Group, Inc., the securities industry’s oldest minority broker-dealer owned and operated by service-disabled veterans pledges a percentage of the firm’s profits to veteran and service-disabled veteran philanthropies as part of its annual Veterans Day charitable initiative. 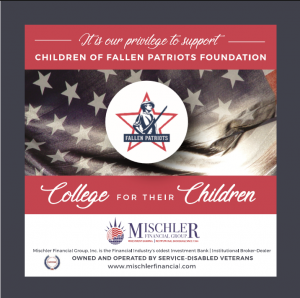 This year, Mischler is proud to announce that Children of Fallen Patriots (CFPF) will be the recipient of the proceeds. Established in 2002, CFPF supports Gold Star families with college scholarships and educational counseling to military children who have lost a parent in the line of duty. Since its inception, CFPF has provided the runway to educational success for young men and women throughout the United States. Mischler Financial Group, Inc. is a federally-certified Service-Disabled Veterans Business Enterprise (SDVOSB). 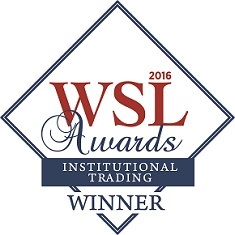 We provide capital markets services across primary debt and equity markets, secondary market agency-only execution within the global equities and fixed income markets, and asset management for liquid and alternative investment strategies. Clients of the firm include leading institutional investment managers, Fortune corporate treasurers and municipal officials, public plan sponsors, endowments, and foundations.